Dali hotels: discount reservation system offered by chinahotelsreservation. Tourist descriptions about Dali: all useful information to organize your stay, included suggestions about tours and convenient booking hotels and rooms arrangement. For detailed Dali hotel information or to reserve a hotel please click on Dali Hotels list. As famous Bai national minority gather live place, Dali has the rich Bai national minority character and style, at the same time Dali also is a very beautiful old city which has the flavor, Her scenery may use four characters broadly: "Love affair", Namely "Xiaguan wind, Shanguan flower, snow in Cangshan Mountain, placenta in Erhai Sea", they are the Dali famous four scenery. Xiaguan also has the name of the wind city; the good well ventilated condition lets the Dali person act as lookout regards as a treasure; Shangguan flower is famous "faces the pearl head ornament". The riot of color, lovely is incomparable; The Cangshan scenery is famous for white snow, the cloud, the spring, the stone. After the summer needless Cangshan snow, goes against in Cangshan's summit, whiteness of driven snow, extraordinary and grand. 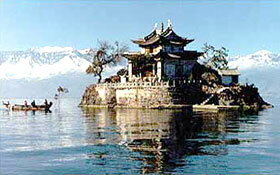 Erhai is the high land moor which has the beautiful scirnce, the element is famous by "the plateau pearl". 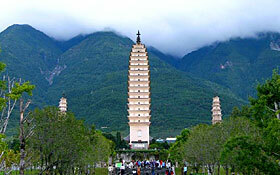 In addition, There are Dali Chongsheng temple, Zhang Shengwen the picture Buddhist the volume, the Goddess of Mercy hall and so on a series of natures and the humanities landscapes.